Sunrise: the perfect place to experience the growth of bustling city-life from the beautiful terraces of Metropica. Located at 1800 NW 136th Avenue in Sunrise, Florida, Metropica goes beyond modern technology and amenities to produce a luxurious, grand, and convenient lifestyle. It’s a rapidly growing community that boasts over 1,300 units of living space of multiple varieties and sizes (including at least 300 townhomes). They will be available in 1, 2, and 3 bedroom layouts, making this community the perfect place for people of all lifestyles, whether single, newly married, or beginning a family, or for the business professional that might be included in any of those categories. This is more than a “residence”, Metropica is a well-thought out community that will incorporate the professional, casual, and relaxing aspects of life into a bustling and modern landscape. Metropica is one of the most elegant and luxurious building options in all of growing Sunrise, FL. This 1,300 unit masterpiece provides 14 distinct floor plans featuring open layouts, expansive views, and floor-to-ceiling glass windows. Units range from 1-3 bedrooms, including exclusive townhome residences. 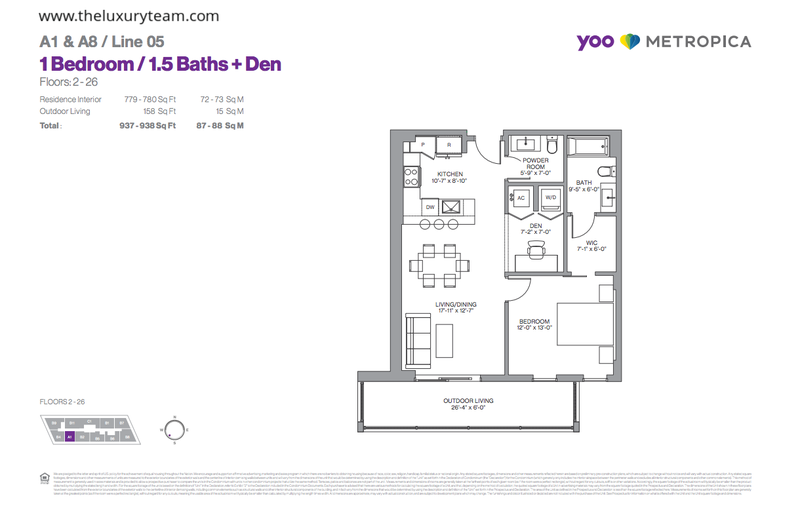 The A1 & A8/ Line 05 floor plans are located centrally in the building and are a great value for luxury living. These 938 square foot units provide all the space you need for dining and entertaining, including an expansive 17×12 foot living/dining area. The unit also include a 158 square foot outdoor living space. 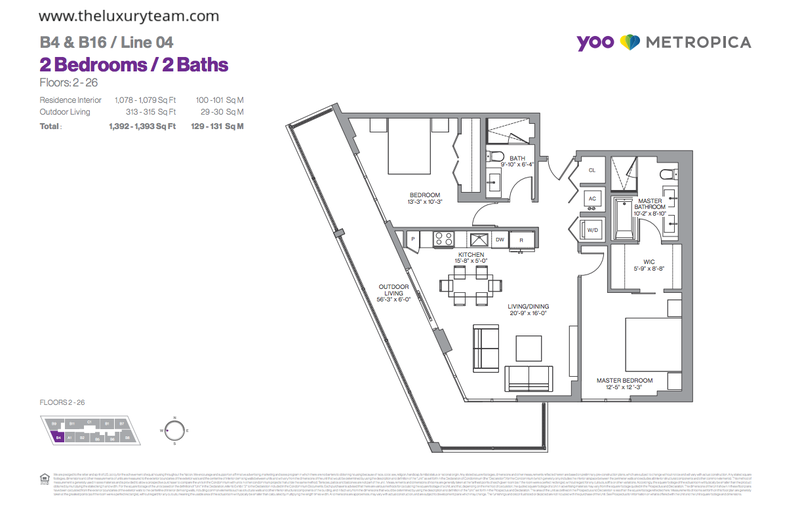 The A3/ Line 01 floor plan is perhaps the smallest at Metropica Condo luxury residences, but has all of the amenities of larger models. This 881 square foot small wonder features a 10×14 master bedroom with direct terrace access. 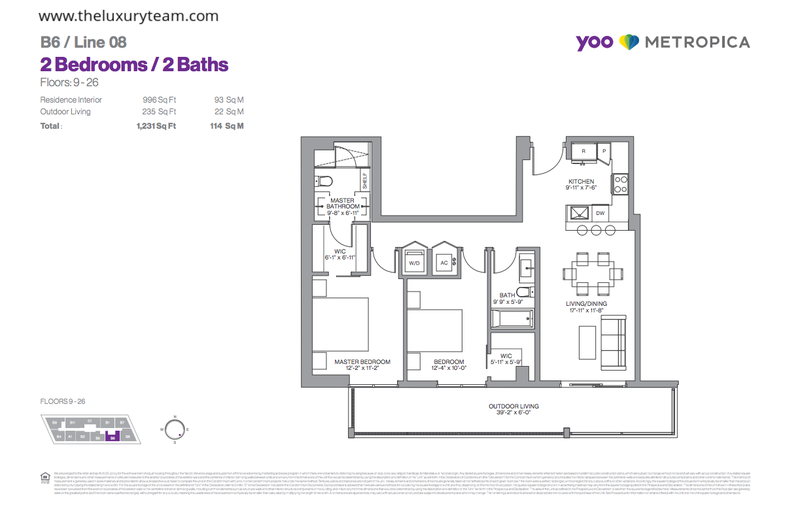 The A4 Line 12, 1 bedroom, 1 bathroom unit is home to 938 square feet of total living space as well as a 19×6 outdoor patio. The open floor plan in the living/dining areas and kitchen create an expansive environment to greet your guests. 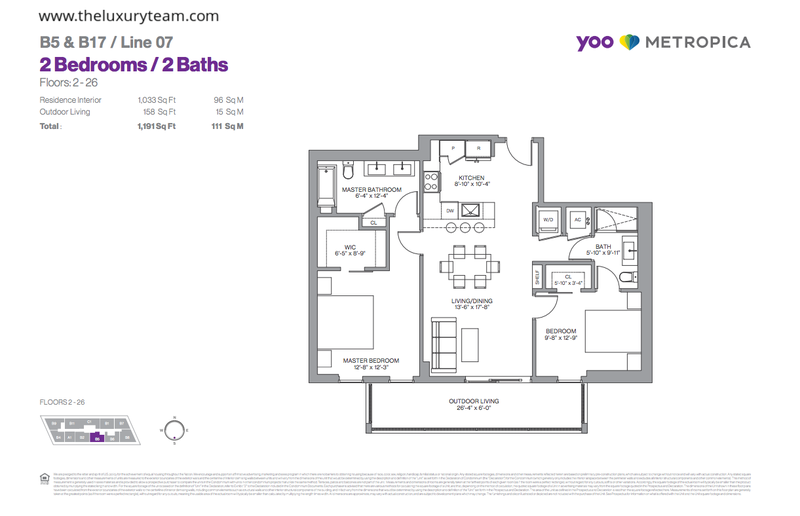 The A5/ line 08 floor plan is available on floors 2-5 and features 767 total square feet of living space. This basic, yet luxurious floor plan has a 158 square foot outdoor living space and a separate kitchen. 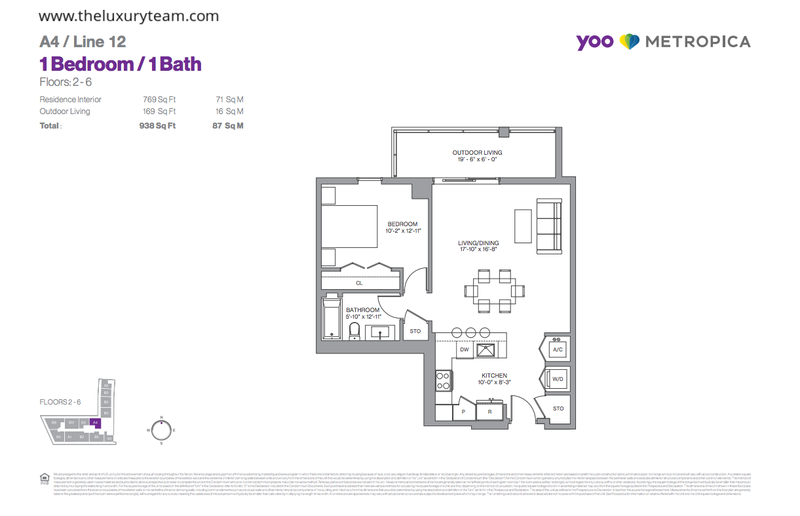 The A6/ Line 17 floor plan is a slightly larger one bedroom model featuring 1,242 total square feet of living space. This 2-floor unit features living and dining areas on the lower floor and an expansive 14×14 foot master bedroom upstairs. Both floors offer terrace space. 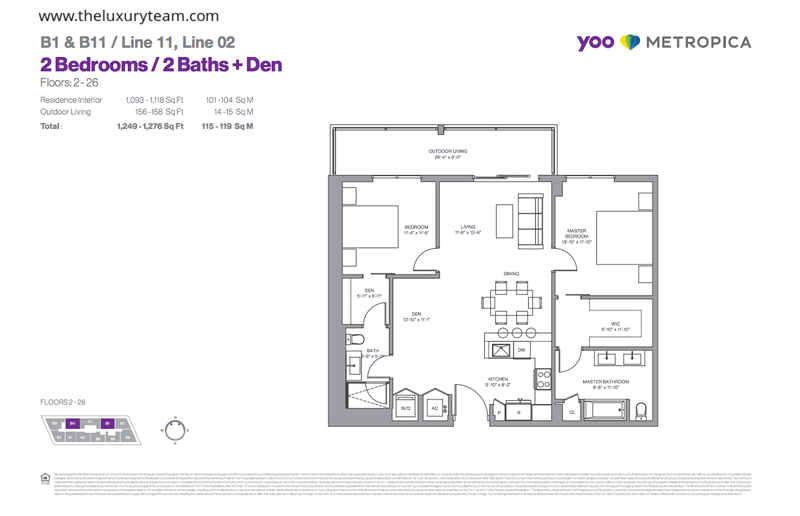 The B1 & B11/ Line 11, Line 02 floor plans provide a 2 bedroom, 2 bathroom option, in addition to a Den area which can be converted into a play area or a home office. 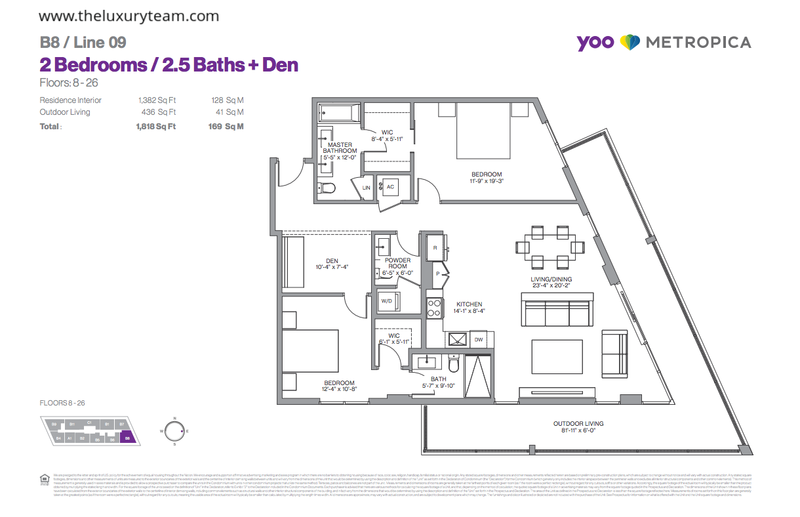 This 1,276 square foot unit has an open kitchen/den/dining area to give the unit an expansive feel. 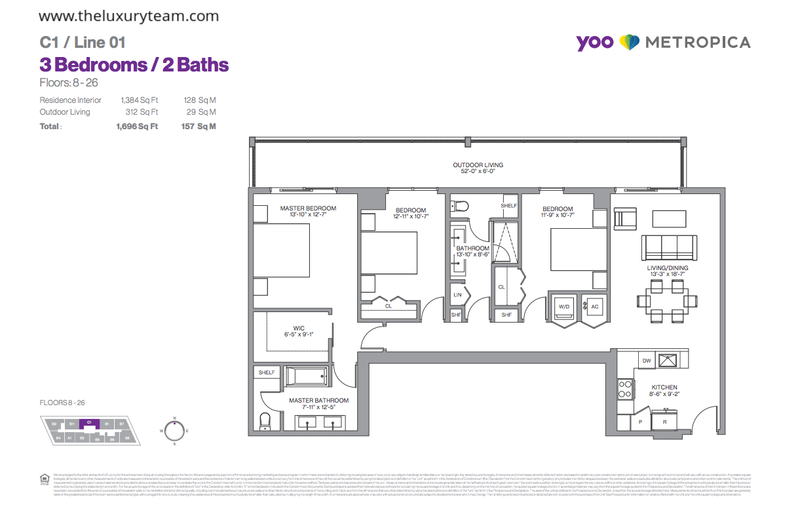 The B2 & B15 / Line 06 floor plan is available on fl00rs 2026 and features 2 bedrooms, 2 bathrooms, and a den through 1,294 square feet. The terrace is situated across both bedrooms and dining areas to provide access from any areas in the home. The unit also features an enclosed Den, as oppose to an open model. 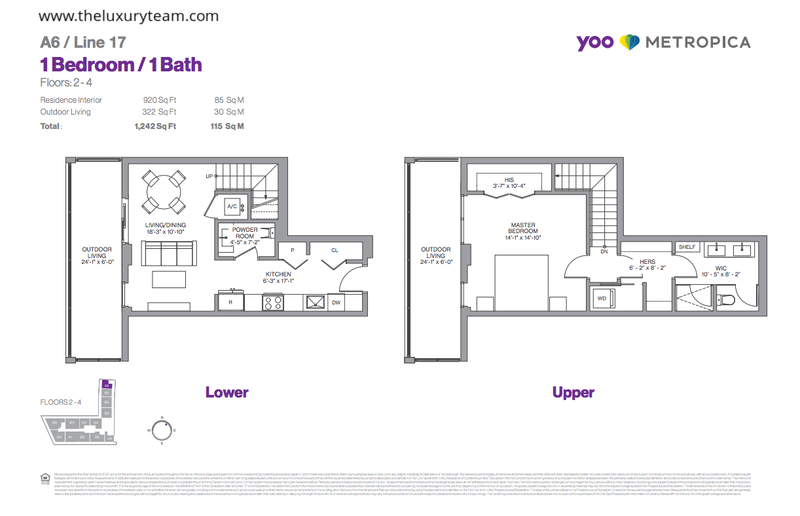 The B4 & B16 /Line 04 floor plans offers up 2 bedrooms and 2 bathrooms of luxurious elegance. This “corner” unit features a 53×6 foot terrace are that wraps across both the kitchen and bedroom areas. 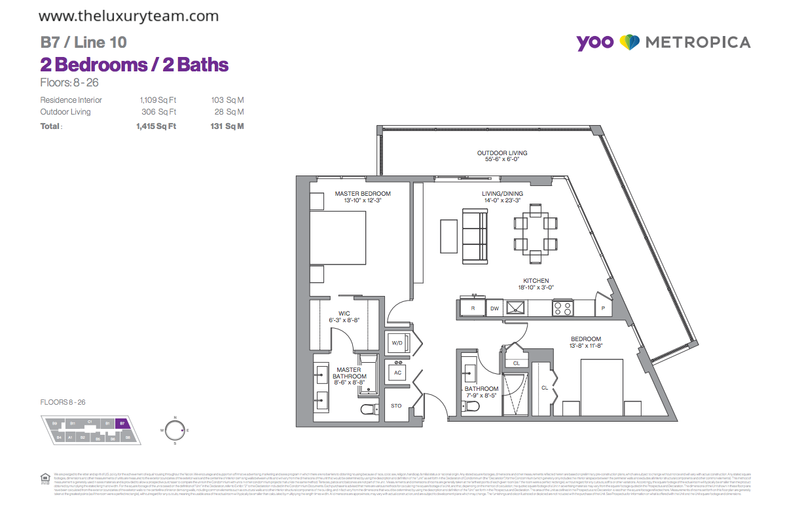 The B5 & B17/ Line 07 floor plan provides 2 bedrooms and 2 bathrooms across a slightly reduced 1,191 square feet of living space. 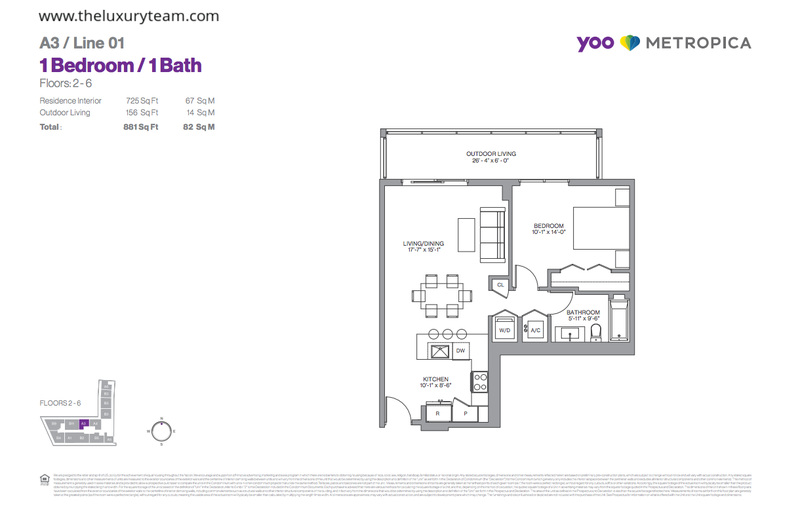 This floor plan is identical to B2 & B15 model in floor plan, but with rooms slightly reduced in size. The B6 / Line 08 model provides an expansive master bedroom at 12×11 feet as well as a spacious walk in closet and master bathroom, all directly connected. The expansive 1,231 square feet of living space is among the largest in Metropica luxury residences. 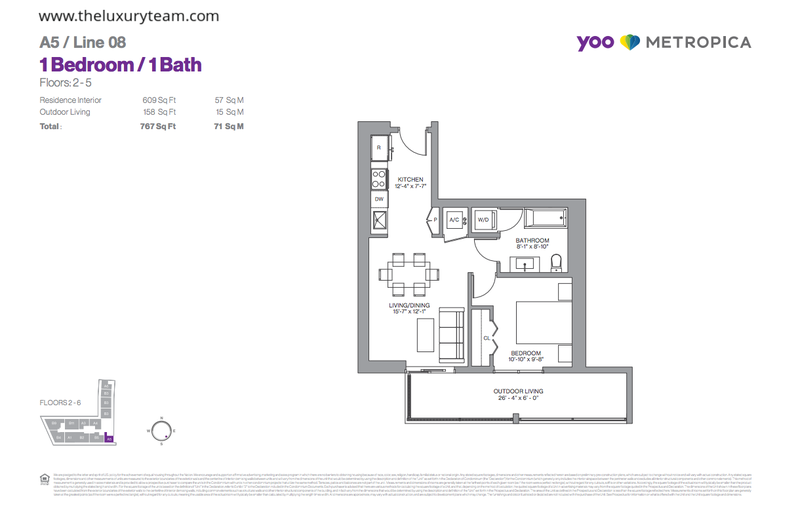 The B7/ Line 10 floor plan is a 2 bedroom, 2 bathroom residence spanning 1,415 total square feet. The triangular shape provides more space in the kitchen, living room, and bedroom. The 13×12 master bedroom comes with an expansive walk in closet and 8×8 master bathroom. 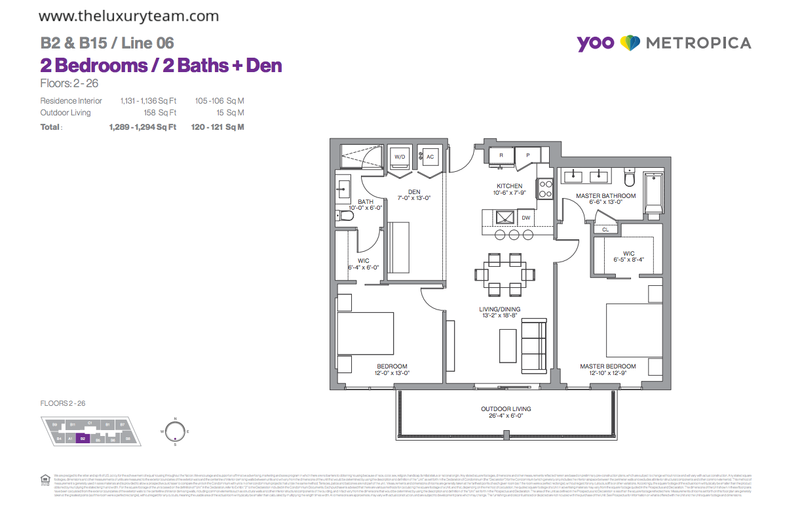 B8 / Line 09 is a corner unit spanning 1,818 total square feet across 2 bedrooms, 2 bathrooms, and an expansive Den. The 10×7 all-purpose space is great for an extra bedroom or home office. The C1 / Line 01 floor plan is located in the center of the building providing beautiful views to the North. 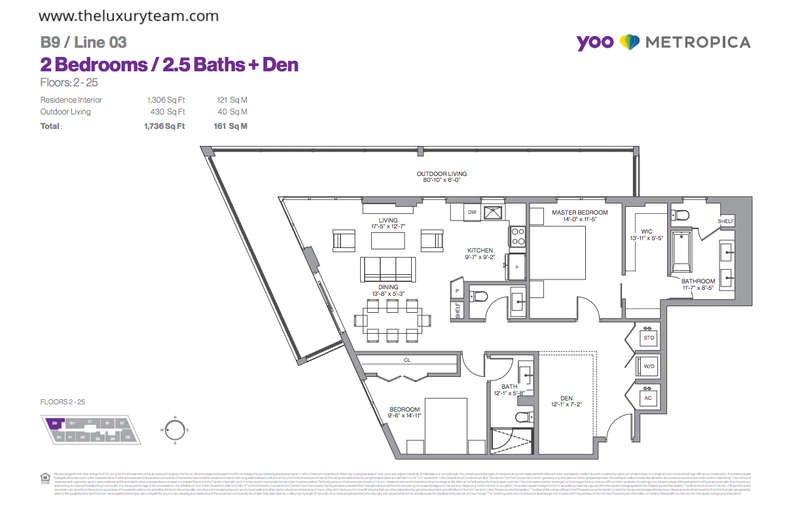 This 1,696 total square foot unit comes fully loaded with 3 bedrooms and two full bathrooms, connected to each bedroom directly. All residences will include gorgeous sliding balcony doors, as well as floor-to-ceiling windows in order to expand the views of your stunning community. Open floor plans with ceilings of up to 9 feet in height will promote a feeling of expansive space. Spacious balconies and walk-in closets allow the resident to customize their living experience however they see fit, and the corner units have wrap-around balconies to ensure airy and luxurious space as well. The kitchens are equipped with gorgeous European cabinetry and designer stainless steel kitchen appliances. The imported porcelain tile and quartz countertops allow the resident a unique, contemporary feel, making entertainment fun and modern. The community provides 24-hour security services and on-site parking. The property also includes a 24-hour fitness center, steam and sauna services, as well as indoor and outdoor massage therapy rooms. The community also boasts a resort-style swimming pool with poolside cabana and lounge, sun shelf for sun-bathing, and two full-size tennis courts. Planning a party has never been easier with the indoor club room, bar, gourmet catering kitchen, and an expansive event space. You can also entertain the kids with a child’s play area, or make it a family day in the outdoor barbecue area with summer-kitchen, and then take them to the movies with the on-site surround sound movie theater. Metropica also provides climate-controlled storage facilities to safely store important items. Metropica is a modern-day utopia, breaking ground for an exclusive living area, with all-inclusive benefits. Do not miss out on your opportunity to become a member of Metropica, these residences will not be available long, and you deserve the chance to make your life as fun, easy, and convenient as possible. Everything! It’s located in a dense shopping area filled with many restaurants and boutique shops. It also overlooks the gorgeous everglades wildlife area. Much freshwater fishing can be found in this convenient location. You can find it at: 1800 NW 136th Ave, Sunrise, FL 33323. Where can I learn more about the Metropica? 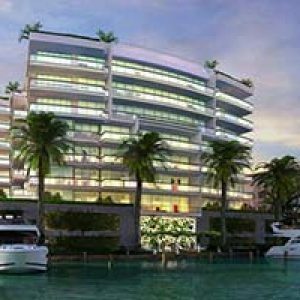 If you’d like to learn any more about the Metropica condos for sale, you can call or leave us a message here on our website. It would be our pleasure to help you get into the condo of your dreams.